A digital photo manipulation of a portrait of a Barred Owl. Beautiful in black and white. Nine colorful squares, one cool owl. Great gifts for owl lovers. A repeated pattern of spoonbill silhouettes in blue and green. 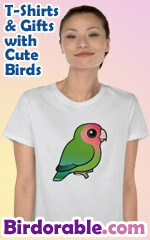 Fun gifts for anyone that loves spoonbills! This fun design features three Spoonbill silhouettes along with a contrasting bar. Text reads "Triple Spoon."